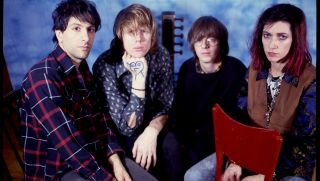 Online musical instrument marketplace Reverb.com has partnered with Sonic Youth to launch the Official Sonic Youth Reverb Shop, which will feature more than 200 pieces of gear used on tour and in the studio by the band as far back as the 1988 and 1989 Daydream Nation tours through to 2011. Additionally, Reverb.com, along with Reverb LP, Reverb’s online marketplace for records and nugs.net, the leading live music distribution platform, have joined with the band to celebrate the 30th anniversary of Daydream Nation. Today, fans can preview a portion of the gear and memorabilia that will be for sale on Reverb starting October 30, purchase one of hundreds of exclusive test pressings and rare records from the band on Reverb LP, and get access to previously unreleased live audio and video content from the archives on nugs.net. "For Sonic Youth fans, this is an incredible opportunity to own a piece of the band's history—whether it’s a guitar that toured with the band for over a decade or a poster they used to promote a show," said Reverb's Jim Tuerk. "We're excited to help the band get this gear and memorabilia into the hands of fans who will take it and make it a part of their own story." · A Koa Travis Bean TB1000A Artist electric guitar that was used by guitarist Lee Ranaldo in 1995 until it was stolen in July 1999. The first guitar (of six to date) to be recovered from the ‘99 theft and purchased back by Sonic Youth, it continued to be played by Ranaldo from early 2002 until 2011. · A Fender Mocha Telecaster Deluxe guitar used by guitarists Ranaldo, O’Rourke, and Mark Ibold from 1987-2009. It was the second early 1970s Tele Deluxe used by Ranaldo and one of O’Rourke’s main guitars while he was in the band, before being played by Ibold until 2009. · A Red Epiphone Dot electric guitar used by Ranaldo from 2006-2009. · A Blue Fender P-Bass guitar used by guitarist and bassist Kim Gordon as a replacement for her stolen Precision Bass. Gordon, O’Rourke, and Moore used the bass guitar on tour from 1999-2004. · One half of Ranaldo’s pedal board, which has remained unchanged since 2007. · An Ibanez Copper Sparkle Talman electric guitar used by Gordon and Moore from 1999-2010. Purchased immediately after the gear theft in July 1999, the guitar was played by Moore for the remainder of the July 1999 gigs, then used by Gordon for “Lightnin” and throughout her solo SYR5 gigs. · A Klon Centaur Silver Overdrive used by Ranaldo in 2006. · Nearly 100 vintage and used effects pedals owned and used by every member of the band from Sonic Youth’s inception to now. Each item in The Official Sonic Youth Reverb Shop will ship with a signed Certificate of Authenticity. While the band’s gear and memorabilia won’t be available for purchase until October 30, today fans can get their hands on more than 300 records on Reverb LP, Reverb’s online marketplace for records. The Official Sonic Youth Reverb LP Shop features rare and out-of-print records from the band’s historic catalog, as well as never-before-available test pressings and records from band members’ personal collections. The shop features test pressings and re-issues of albums ranging from Daydream Nation and Murray Street to Goo and Experimental Jet Set, Trash and No Star, as well as additional pressings from Sonic Youth Recordings and Goofin’ Records. Today, fans can also access the first round of content released by nugs.net as part of an ongoing live archival release program featuring audio and video releases from different points in Sonic Youth’s career. While new content will be released on an ongoing basis, the first round of releases will include Daydream Nation recordings as well as concert footage from Lance Bangs’ Sonic Youth film of the band performing the album in Glasgow in 2007. To preview the items that will be available in the Official Sonic Youth Reverb Shop or to purchase an item from the Official Sonic Youth Reverb LP Shop head over to Reverb.com.